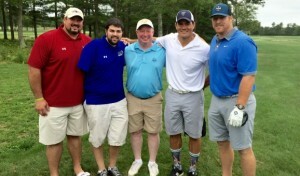 After one of the worst winters in New England history, summer has finally arrived, and with it came one of our favorite (Up)Beat traditions: the annual Joe Andruzzi and Friends Golf Tournament! Yesterday’s event was a huge success (more on that below), and we’re grateful for all of the generous support we received to help make our seventh annual golf outing one to remember. But that’s not everything that kept JAF busy in June – read all about the month that was below! Every year we are blown away by how generous our supporters are, and this year’s golf event was no exception! This year’s Seventh (yes, SEVENTH!) Annual Joe Andruzzi & Friends Golf Tournament, once again at the beautiful Pinehills Golf Club, was a HUGE success, as we raised more than $265,000 that will directly support families battling cancer, both financially and emotionally. Since we started the event seven years ago, our Golf Tournament has now collectively raised more than $1,311,629+. And we couldn’t have gotten here without the continued support we receive from our Presenting Sponsor, East Commerce Solutions, Inc. Thank you for your incredible generosity and commitment to our mission! We are also incredibly grateful to all the athletes, celebrities, and participants who generously donated their time and money towards the event and auction. This annual event enables us to keep on giving to patients and families whose lives are affected by cancer, and we are forever grateful to everyone who joins us in this mission. Click here to read more about the event on our blog, where Jen recapped the upbeat day of sunshine, laughter, and generosity. Check out stories about the event in the Boston Globe, Boston Herald and FOX25 as well! 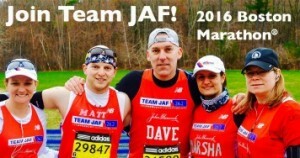 Attention Runners: Team JAF Wants YOU! Summer seems to already be flying by, and August will be here before you know it! Did you get shut out of the Falmouth Road Race lottery? Still looking for an entry number? The Joe Andruzzi Foundation’s Team JAF runners will once again be taking strides against cancer at the 43rd New Balance Falmouth Road Race in Woods Hole on Sunday, August 16, 2015, and we’re looking to field our strongest team ever! Do you want to run with Team JAF this year? Visit our Falmouth Road Race event page and fill out our online application today! But hurry, bibs are going fast! Learn more here. Tis the Season for (Up)Beat Outings! June was filled with sunshine, which lent the perfect opportunity for JAF to invite patient families to enjoy some fun outdoor activities! 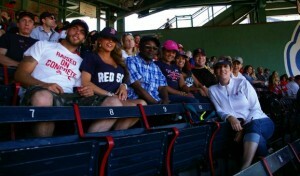 As part of our ongoing series of (Up)Beat Outings that help take patients minds off of treatment – even if just for an afternoon – CVS Health and JAF invited a group of recipients and their guests to the Red Sox game on Sunday, June 14. Just a week later, we also invited a group of patient families to join JAF staff at the Monster Jam monster truck rally at Gillette Stadium. Check out photos from both the Red Sox and Monster Jam outings on our Facebook page, and be on the looking for more (Up)Beat Outings this summer! This Summer, please consider joining our (Up)Beat Pledge program, in which recurring monthly donations directly benefit cancer patients and their families. The need never ends, and that’s why ongoing support is so important. Available levels include Smile: up to $10 monthly; Grin: up to $25 monthly; Happiness: up to $35 monthly; Laugh: up to $50 monthly; and Crack Up: $50+ monthly. Read more about this program on our blog. 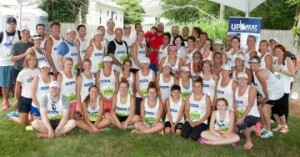 The Joe Andruzzi Foundation’s Team JAF runners will once again take strides against cancer at the 43rd New Balance Falmouth Road Race in Woods Hole on August 16, 2015. Visit our Falmouth Road Race event page and fill out our online application today! 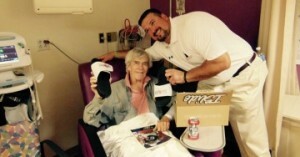 Just a few weeks ago, JAF had the pleasure of visiting a group of patients receiving treatment at Beth Israel Deaconess (BID) Hospital in Plymouth – and thanks to a great partnership, we were able to deliver some goodies to the unsuspecting patients.As a recap, in April, we were honored when up-and-coming footwear brand, ISlide, named JAF as its “ISlides4Good” charity of the quarter. From now through the end of June, all proceeds from each pair of the “(Up)Beat Cancer” slides sold will directly support JAF’s mission of providing financial and emotional relief to cancer patients and families in need. Thanks to an incredibly generous JAF supporter who donated 14 pairs of the slides, we were able to surprise each patient we visited at BID Plymouth with their own customized pair. Getting through treatment has so much to do with being comfortable, and everyone was thrilled to slip into some cozy sandals. You can check out photos of the visit on JAF’s Facebook page (here) – and visit bit.ly/JAFiSlides to customize your own pair of (Up)Beat Cancer slides (TODAY IS THE LAST DAY!). 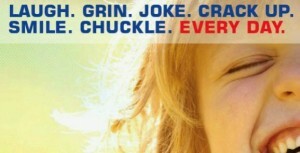 Remember, all proceeds benefit JAF patients and their families – and the need is endless.